Last week it was mint, and this week I’m figuring out what to do with the blueberry harvest. Besides the usual pick, rinse, and put on counter in colander whereupon they disappear magically. I have three mature high-bush blueberries that grow near my driveway (just above a bank of Hemerocallis fulva, common orange daylilies, that are in bloom now and look great with the blue but do have to be pulled out when they invade the berries’ space. Shout-out to Wendy – we ate daylily buds for dinner last night!). 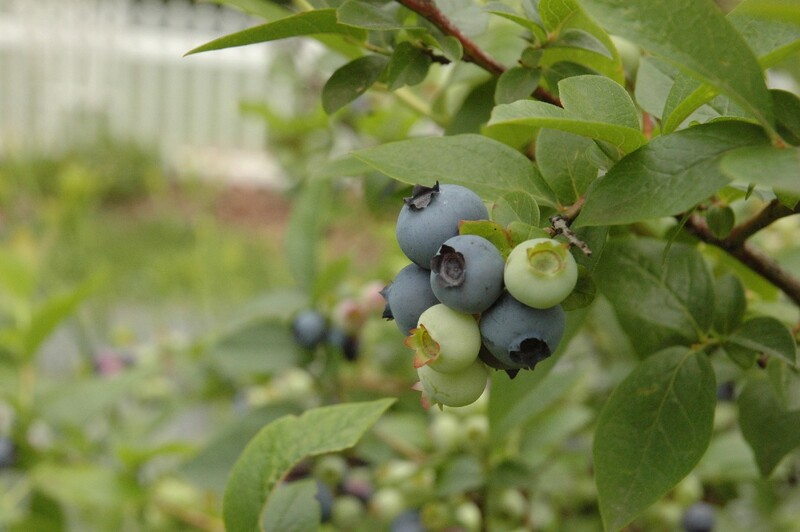 Blueberries are attractive shrubs and shouldn’t be hidden away – make them part of your landscaping! My three – which I note for the record (and because I actually found the record, which like most of my gardening records is scribbled in a random notebook instead of entered neatly in a journal) are Ivanhoe, Herbert, and Atlantic cultivars – ripen in sequence in that order, the first berries coming in the first week of June and the last sometime later in the month. I don’t always get the last ones since the birds are on to them by then, and if I ever plant more in another location I may work out a system to cover them, but from these I get most of the berries even if the birds share a few. Blueberries do need an acidic soil (4.3-5.3 pH – have a soil test and amend with sulfur if necessary) and plenty of water. Aside from that, they are not hard to grow (in full sun or with a little afternoon shade) and are truly rewarding. Here’s what I made for a dinner appetizer last night. This is another recipe from Mark Bittman’s How to Cook Everything (I use that cookbook a lot!). Cook the blueberries, water, sugar and cinnamon over medium heat in a saucepan until the blueberries get really soft (about 10 minutes). Give it a few minutes to cool and then puree it in a blender (may have to do this in batches if your blender is on the small side, like mine). Adjust the taste if necessary, chill in fridge, and then mix in the yogurt/sour cream. Serve cold. It was really good! And a striking color. 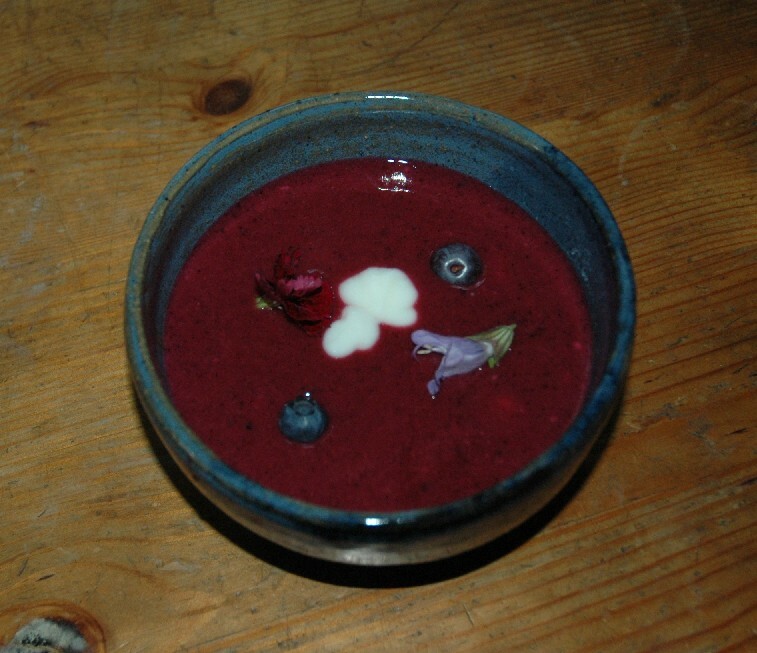 The garnish is a dollop of yogurt, a couple of blueberries, and edible dianthus and culinary sage flowers.